Description: Notice how N.S. has removed and welded over the marker lights on the short hood. Description: Another photo of SD40-2 3341. 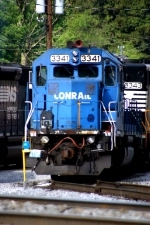 Can't have too many photos of engines still in their Conrail paint! 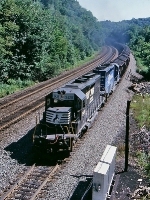 Description: SD40-2 3341 and another helper lead a westbound freight into Horseshoe Curve. Description: The old PRR station sign still hangs from the Latrobe Station. 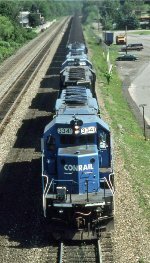 Description: The helpers for 11A push up the grade and are both of Conrail decent. Description: The coal train had four helper locomotives on it and they were all giving all that they had to push the train. Description: Helpers pushing a train westbound at Lilly. Description: Shoving a load of western coal eastbound through CP MO. 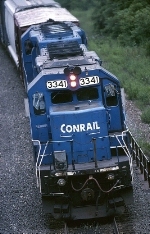 Description: Ah yes a beautiful site three out of four SD40-2's in the Conrail paint scheme. Cant beat it. Description: The NS unit st the end of the four unit set spoiled a possible pure Conrail set all in Conrail Quality paint scheme. NS 3341 (ex-CR 6376). Description: I never get tired of Cresson!